Powerful virtual servers with Intel Xeon CPU and Enterprise SSD for best performance. The MVPS (Managed VPS) offers all the convenience of shared hosting, but your site is located on a separate, independent virtual server. It provides security, flexibility & reliability. SSD technology makes the service even faster. The perfect option if your service needs more power. Administration of the Virtual Server is Serviced by the Future Hosting Team. Managed VPS is a suitable solution for the need for an independent and flexible Hosting Service for Customers who do not have System Administration Knowledge. We use Enterprise NVMe SSD Drives for ultra fast response times. Intel Xeon Skylake processors - fastest on the market for best performance. 1 Gbps port speed on each node with multiple levels of redundancy. Full Root Access & Control Panel to Restart, Reinstall, etc. Contact our team with your query and we’d be happy to help. Our optional DDoS protection will stop attacks up to 1 TB/s. The starter plan looks like the right choice for you! What is a VPS Server and is it suitable for me? The Virtual Server (VPS) is a standalone server that works with other virtual servers on a physical machine. The operation of the virtual server is completely independent of the other VPSs on the same machine. Each VPS may have different parameters, such as HDD, RAM, and operating system. If we rank shared (shared) hosting, VPS, and a dedicated server, the virtual server takes the best of the other two - the low cost of regular hosting and the power of the leased server. The virtual server is suitable for anyone who does not want shared (shared) hosting restrictions but does not want or can not afford to hire a physical server. With VPS, you are free to use the resources provided as you find fit. You want a mail server - no problem! Or an IRC server? Or, some online stores? With a virtual server you can have everything at once! Can I control my VPS without a Control Panel? The control panel for a VPS can be both an advantage and a drawback. The advantage is the convenience of easy resource management and virtual server. The deficiency of most control panels is the resources they take and which can be used for other more useful purposes. As an example, we can give you a cPanel that can not work well on VPS with less than 512MB of RAM. Managing a virtual server without a control panel, however, can be a great challenge as it requires Linux knowledge. Here is a matter of customer preference. We recommend Virtualmin as a control panel to manage your VPS as it is free, reliable, and multifunctional. Of course, you can choose the installation of your VPS and control panel. What is Virtualmin and how does it work with it? 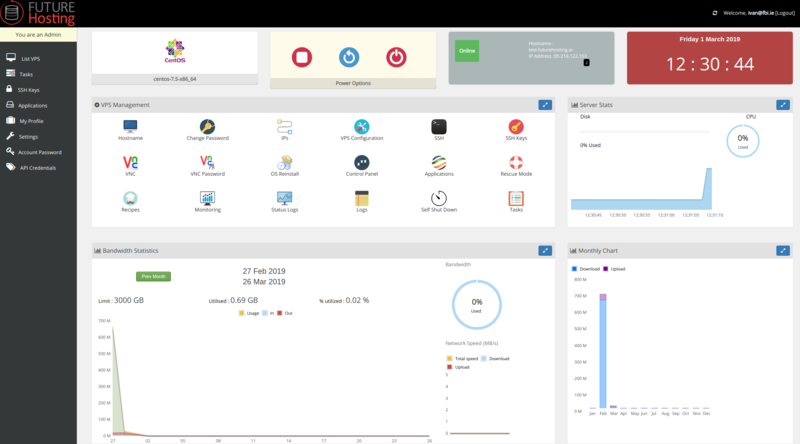 Virtualmin is the most common and uncomplicated open source control panel for Linux and BSD systems. It is created by Webmin developers and contains easy-to-use tools to manage your websites, mails, databases, applications, and more. The easy-to-use Virtualmin tools made us plug it into any VPS plan purchased from Future Hosting. How do I access the administrative panel? https: // IP-to-your-virtual-server: 10000 So look at the address of the administrative panel where you only need to change the IP address with your. You notice that the https protocol is used because the panel itself uses a self-signed certificate. In most cases, your browser will indicate this, but you only need to move on. Can I use additional support? We can offer additional support. If you need to install specialized software, a specific setup, or need professional help, you can always contact us for more information.